Round 2 was upon us, and we were looking at match ups that would be memorable forever. Here, we break down all the games from Round 2, Game 1 with statistical capsules to go with it. 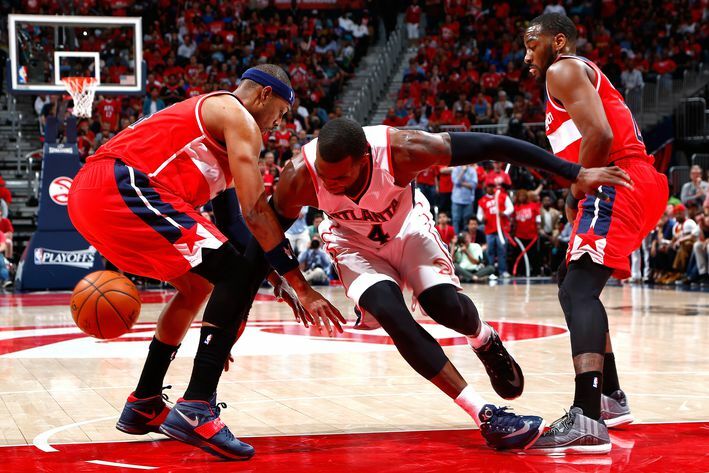 After resting for so long, the Wizards were finally back in action and were up against the one seeded Hawks who were coming off a 4-2 series win against Brooklyn just two days ago. Carroll just exploded in the first, he scored 13 and helped his team jump out to a 37-26 lead early. Atlanta was swinging the ball around so fluently, it was just so beautiful to watch. I've been so amused with the way Carroll has been playing as of late, he scored 8 second quarter points that kept the lead for the Hawks. Washington had no answer for them once they would score a basket, they couldn't go on a huge run and get big stops to cut the deficit. An 8-0 run was by Washington was led by John Wall, but the Hawks put a run together of their own as they scored 7 straight points, another 8-0 run occurred by the Wizards and they found themselves down by two. The Hawks were up by 2 after three. 9 points by Beal in the third helped the Wizards comeback as well as John Walls 6. To start the fourth, the home crowd was shocked as Washington put together another 8-0 run to jump out to a 6 point lead. It was with 14 seconds left as Gortat hit the dagger to seal the deal for his team, it was a huge comeback and Washington still hasn't lost in the playoffs yet! Loved the action in this one, the game was back and forth and both teams put a huge effort out there. Notable Stats: Beal- 28 PTS. Wall- 13 AST. Gortat- 12 REB. Carroll- 24 PTS. Millsap- 8 AST. Horford- 17 REB. It was huge game one for both teams, as the Cavs were missing two starters on their part and the Bulls really needed to take game one since the Cavs were short handed. Dunleavy shined in the first quarter as he scored 13 points and his team jumped out to a 12 point lead early. A 5-0 run in the second helped Cleveland cut the deficit to six. At the half they were only down by 5 behind Irvings 14 points during the period. After the Cavs tied it, the Bulls pulled away from them once they went on a 15-0 run. Rose, Butler, Gasol, and Brooks all contributed to put the basketball in the net and helped their team pull away in the third. Once the fourth began, the Cavalries went on a 10-2 run to only be down by three. Jimmy Butler hit the dagger with 30 seconds left to extend the Bulls lead to six. He was key in their victory tonight as he defended James very well as Lebron had an off shooting night and struggled against Chicago. For his standards, he had a bad game. Notable Stats: Rose- 25 PTS. Gasol- 10 REB. Butler- 6 AST. Irving- 30 PTS. Lebron- 19 PTS, 15 REB, 9 AST. Memphis was without their PG Mike Conley for game one, and it'd be hard for them to steal one in Oakland. Barbosa led the way with five points to start the first and they had a comfortable 7 point lead after one. Memphis couldn't get anything going in terms of going on a big run, Golden State were shooting lights out and they wouldn't be stopped. Curry had 8 in the second. The third was another slow quarter for Memphis, Golden State outran them and were the better team on Sunday. Up by 17 after three. There was no exciting action in the fourth, the Grizzles missing piece was gone and it was hard to play without him. Notable Stats: Curry- 22 PTS, 7 AST, 4 STL. Bogut- 6 REB. Gasol 21 PTS, 9 REB. Randolph- 5 REB. Chris Paul was a late no go for last nights game, but it wasn't a problem. Harden and Ariza scored 16 points combined after one and had a 6 point lead throughout one. A 9-1 run was huge one for LA, they'd end the quarter with being down by only 4 and felt good going into the locker room. The Clips went on another run which was a 6-0 run and tied the game up. They winded up leading by six after three and they were led by JJ Redicks 12 points. After an 11-0 by LA, they had the game in their hands and sealed the deal without their PG. It was a HUGE win for them, especially without their best player. Notable Stats: Griffin- 26 PTS, 14 REB, 13 AST. Howard- 22 PTS, 10 REB. Harden- 12 AST. Recap from the opening games to Round 2 of the 2015 NBA Playoffs.